Wittenberg, a small Saxon town in the former East Germany, is getting ready for something big. All over town banners with an image of Luther and the text "Luther 2017 / 500 Years Reformation / in the beginning was the word" hang from buildings and streetlights. The castle and castle church are being renovated at immense expense. Churches and faith communities from around the world have been invited to plant five hundred trees in a Luther garden. Gift shops sell a Playmobil figure of Martin Luther, complete with academic beret, feather pen, and miniature German New Testament. It doesn't take too much cynicism to ask, why this frenzy of branding, building, planting, and selling to commemorate the 500th anniversary of when one Dr. Martin Luther, an unknown German monk, pounded (or perhaps didn't pound) 95 theses about indulgences to the door of a church? Luther 2017 is a big German production; internationally, smaller groups have also been considering how to mark 500 years of Protestantism. 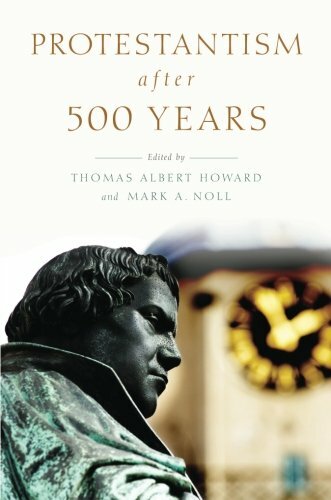 Four years ago, Thomas Albert Howard and Mark Noll gathered historians, theologians, and a legal scholar at Gordon College, far away from Wittenberg, to ponder how the Reformation ought to be commemorated in 2017, not in building projects but with intellectual consideration. Their replies created Protestantism after 500 Years. A brief review cannot even mention all the chapters, but it can suggest useful wisdom to prepare for this important anniversary.